Although it may not seem apparent, everything on a webpage is in a box. 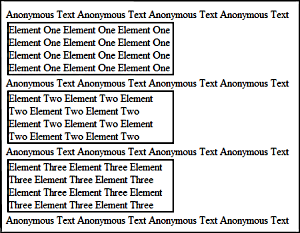 It's apparent that certain elements, like tables are in boxes, but what if you just enter some text? Actually, good web design requires that everything on a webpage be inside a container. So text should be inside a <p> paragraph or other type of container. But if you just enter text, the browser automatically puts it inside an anonymous box. When you load a webpage into a browser, it flows the boxes onto the page. The normal flow is from left-to-right from top-to-bottom. This type of flow is called inline. But some html elements flow as a block. A box that flows as a block has an embedded line-return before and an embedded line-return after its box. An example of an inline element is a <span>. 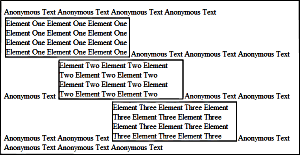 A span, and its contents will flow inline on the webpage from left-to-right from top-to-bottom along with the other inline elements. It will flow along the same baseline as text on the webpage. An example of a block element is a <div>. A div, and its contents will break the left-to-right from top-to-bottom flow pattern and move to the left side of the webpage. It will also cause the next element following the div in the html to move to the left side of the webpage. The <p> paragraph is another block element. The nice thing about a block element is that you can give it a width and height. The W3C specification does not accept the width property for inline elements. An inline element will stretch horizontally as long as required to flow its contents. The W3C specification does not accept the height property for inline elements. The height of an inline element is the same as the line-height.